In the process I revisited one of her greatest and most unusual performances: when she filled in, at the 11th hour, for an ailing Luciano Pavarotti at the 1998 Grammy Awards. She sang “Nessun dorma” from Puccini’s opera “Turandot” — a kitschy aria so overdone it was even used by President Trump on the campaign trail in 2016. “Rimsky-Korsakov and His World” is the focus of the Bard Music Festival, which continues this weekend with a multifaceted reappraisal of this Russian composer, who in the West is known only for a tiny fraction of his output. The concerts and lectures I attended last Saturday and Sunday gave me a new understanding of the forces shaping Russian music at the time, even if I did not come away agreeing with Mr. Taruskin’s verdict, quoted above. It’s not the first time Mr. Botstein and Bard have championed Taneyev; they did his mighty opera “Oresteia” in 2013. And Dmitri Hvorostovsky, the beloved Russian baritone who died last year, sang five of his elegant songs at a Carnegie Hall recital in 2011. Well, Len, the solution is in your own CD player. If only all problems were so easily resolved. Can you fit Donald Trump in your CD player, if you slice him very thinly? Taruskin makes a good point about Nikolai Andreyevich Rimsky-Korsakov. 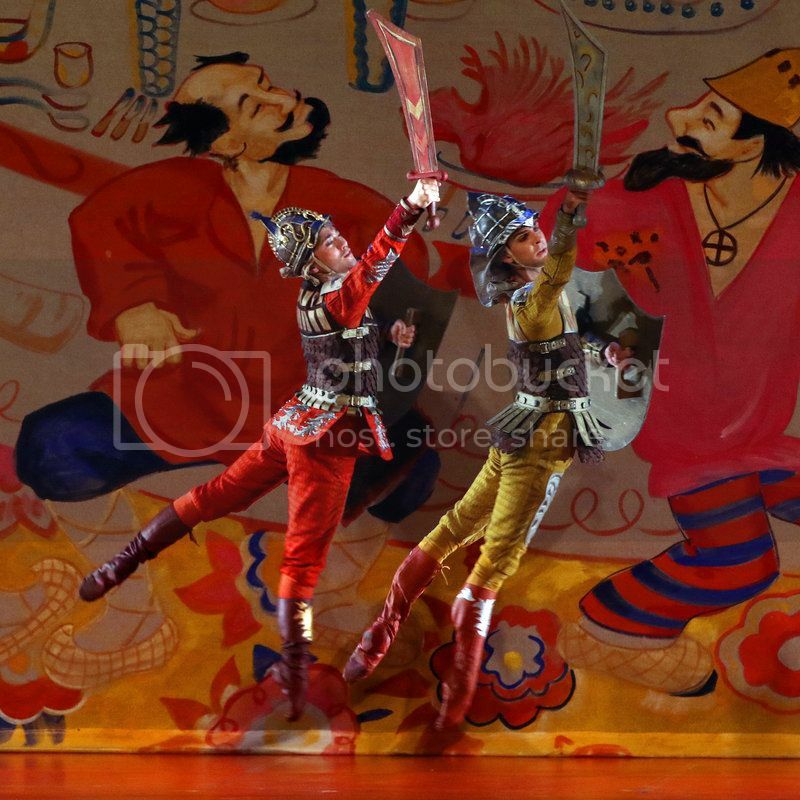 A scene from American Ballet Theater’s 2016 production of “The Golden Cockerel,” with music by Nikolai Rimsky-Korsakov, the subject of this year’s Bard Music Festival. ANNANDALE-ON-HUDSON, N.Y. — If your reaction to hearing the name Nikolai Rimsky-Korsakov is a shrug, even a smirk, you’re not alone. In the West, this 19th-century Russian composer is principally known for orchestral showpieces like “Scheherazade,” with its come-hither violin solo, or the sequined, castanet-happy “Capriccio Espagnol.” These works cemented Rimsky-Korsakov’s reputation as a master of color — which is to say, of decorative, surface charm — long before critics reframed his Orientalism as imperialist dreams. I can’t say that’s a judgment I quite came to share based on the music I heard over the weekend. But I left Bard with a newfound appreciation for a quality I had never before considered as a factor in music: shame. For Rimsky-Korsakov (1844-1908), shame was both a spur and a block. As an inferiority complex vis-à-vis Western culture, it played an important role for him and others who sought a national style in Russian music. Hallmarks of the movement were an emphasis on Slavic folk traditions; exotic flavors, invented or borrowed from the southern fringes of the Russian empire; and a deep-seated suspicion of expertise as a vehicle for cosmopolitan — today one might say globalist — dilution of national identity. That wariness of specialists was convenient, since most of the leading composers in this loose group were army men, landowners or, in the case of Alexander Borodin, scientists: in another word, amateurs. Intuition, rather than technique, was their guiding compositional process; melody was king, and awkwardness a sign of authenticity. Borodin’s String Quartet No. 2, which received a burnished reading by the Parker Quartet on Saturday, is an example of the lyricism and freshness this approach could produce, but also demonstrates its stretches of harmonic helplessness. In 1867, the critic Vladimir Stasov appealed to public sympathies for the local underdogs in a rave review of a Pan-Slavic concert when he invoked divine protection for “this mighty little handful of Russian composers” — a term that stuck. Also translated as the Mighty Bunch or the Mighty Five, it came to describe the circle which included (but was not limited to) the composers César Cui, Mily Balakirev and Modest Mussorgsky as well as Rimsky-Korsakov and Borodin. But shame of a personal kind propelled Rimsky-Korsakov to break with their principles. In 1871, he accepted a professorship at the fledgling St. Petersburg Conservatory, where he found himself having to teach fundamentals of music theory he barely understood. “I was a dilettante and knew nothing,” he later wrote in his autobiography. For the next three years, with an admirable combination of humility and diligence, he set about teaching himself counterpoint, composing dozens of fugues, and poring over scores by Bach, who had been a particular target of disdain among the Mighty Bunch. At Bard the pianist Danny Driver performed one such exercise, a Fugue in G Minor, as an endearingly clunky testament to a midcareer artist hard at work on self-improvement. 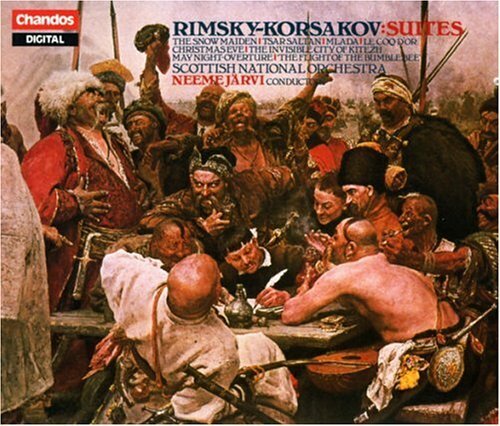 Rimsky-Korsakov emerged from this period a vastly more polished composer. In fact, his technical command now approached that of Tchaikovsky — an example, to his detractors, of overly smooth cosmopolitanism. In his direction, Mussorgsky sniffed at unnamed “soulless traitors” to the nationalist cause. Yet at first, Rimsky-Korsakov applied his new technical facility to deepening, rather than abandoning, the principles of Russian music. At times his insecurity returned to haunt him and he would stop composing for periods during which he orchestrated or completed works by others. His own melodies still drew on folk material, as in the Piano Concerto in C-sharp Minor, which received an eloquent reading on Saturday by the pianist Orion Weiss. Its tune is drawn from one of Balakirev’s collections of folk songs, treated with Lisztian brilliance while vivid wind solos compete for attention. Orientalist fantasies continued to fuel the music of Rimsky-Korsakov and his colleagues, but the Bard festival, and the fascinating collection of essays published in a companion volume, make a case for a more subtle reading of these strands. For sure, pride in the Russian colonial enterprise went a long way in compensating for niggling feelings of inferiority toward the West. Tone poems like Rimsky-Korsakov’s lugubrious “Sadko” or Balakirev’s “Tamara” grew out of an appetite for the East that mixed anxiety with longing. Presented side by side by Mr. Botstein, the formulaic nature of their exotic gestures came through: spicy augmented intervals, shimmying triplets and downward tumbling, slippery scales. But it was Russian fairy tales that exerted the most lasting pull on Rimsky-Korsakov and inspired most of his operas. In their nostalgia for a premodern society, they reveal his ambivalence — perhaps tinged, yes, with shame — toward czarist might and the progress of Russian history. His final opera, “The Golden Cockerel,” is a barbed critique of the Russo-Japanese War. What makes the Bard Music Festival so satisfying is the space it gives for nuance and contradictions. A program on Sunday of mostly vocal music inspired by Pushkin revealed a treasure trove of overlooked gems alongside famous scenes from operas by Mussorgsky and Tchaikovsky. (The standout stars were the tenor Gerard Schneider and the mezzo Nadezhda Babintseva.) In its second weekend, the festival will explore other areas of Rimsky-Korsakov’s influence, and offer rare performances of his operas “The Tsar’s Bride” and “Mozart and Salieri,” a setting of a Pushkin play that reflects on the nature of genius and the limits of diligence. It might be instructive to analyze that, too, in terms of a lingering inferiority complex. It’s possible that I’m according too much importance to shame here. But the defensive streak in Russian culture runs deep, even today. It’s the narrative backbone of Alexander Sokurov’s 2002 film “Russian Ark,” in which the Marquis de Custine, author of a snarky 19th-century travelogue, guides the viewer with a mix of haughty put-downs and disbelieving admiration for Russian art and music. And it pops up in a television documentary on the Russian star soprano Anna Netrebko, in which she is described as stunning the “sophisticated European public” with the “incredible inner freedom” of her art, the polished West and earthy East in opposition yet again. The legacy of the Mighty Bunch and the first-rate music it left behind is also an enduring underdog mentality. I am a huge Rimsky-Korsakov fan. I have that Chandos set and I have recordings of nearly all of his operas, although I am trying to get a recording of "Tsar Saltan"; it seems that there is no modern stereo recording (calling Valery Gergiev!). One of my all-time favorite operas is "The Golden Cockerel" ("Zolotoy Petushok" as my Russian-speaking grandfather would have called it), which got him in a huge amount of trouble with the Czarist government, of which Rimsky-Korsakov was a principled liberal opponent despite his own aristocratic background. "The Golden Cockerel" was the initiator of a whole series of satirical Russian operas, including Shostakovich's "The Nose," Schnittke's "Life with an Idiot," Desyatnikov's "Rosenthal's Children," and Shchedrin's "Dead Souls" and "The Left-Hander." 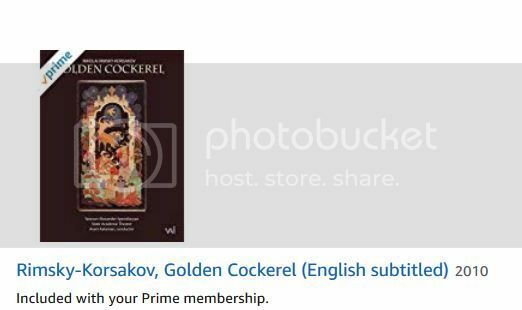 I have several: "The Golden Cockerel," "Kashchei the Immortal" which foreshadows Stravinsky's "Firebird" in more than its name, and "The Legend of the Invisible City of Kitezh." Here in New York we've had the opportunity to see two productions of this, both by the Mariinsky Opera conducted by Valery Gergiev; there was talk that the Met might do its own production (or borrow the Mariinsky's), but as Gergiev's activity there has diminished, I don't suppose this is going to happen. And then there's "Sadko," and "Christmas Eve," and...well, you get the picture. I'm a fan. Good news - there is a new DVD of "Tsar Saltan " out from the Mariisky opera with Gergiev conducting . Must get this as soon as possible . Len, thanks for that article. My favorite opera by Rimsky-Korsakov is "Tsar's Bride," which was made into a film by the Bolshoi during the 1960's and was issued on VHS in the West by Kultur. The Golden Cockerel (also known as "Le coq d'or," or, in the original Russian, "Zolotoy Petushok") was Rimsky-Korsakov's last opera. The opera's biting satire of the Tsar and Russian imperialism made it controversial for its time. Orchestra, Chorus, and Corps de ballet of the Yerevan Alexander Spendiaryan State Academic Theatre of Opera and Ballet; Aram Katanian, conductor. Live performance, 1986.